امیدیان, فرانک, علیپور, ندا. (1396). نقش واسطه‌ای هوش فرهــنگی در رابطه بین ویژگـی‌های شخصیتی با مهارت‌های اجتماعی و پیشرفت تحصیلی دانشجویان. پژوهش های روانشناسی اجتماعی, 7(27), 79-100. فرانک امیدیان; ندا علیپور. "نقش واسطه‌ای هوش فرهــنگی در رابطه بین ویژگـی‌های شخصیتی با مهارت‌های اجتماعی و پیشرفت تحصیلی دانشجویان". پژوهش های روانشناسی اجتماعی, 7, 27, 1396, 79-100. امیدیان, فرانک, علیپور, ندا. (1396). 'نقش واسطه‌ای هوش فرهــنگی در رابطه بین ویژگـی‌های شخصیتی با مهارت‌های اجتماعی و پیشرفت تحصیلی دانشجویان', پژوهش های روانشناسی اجتماعی, 7(27), pp. 79-100. امیدیان, فرانک, علیپور, ندا. نقش واسطه‌ای هوش فرهــنگی در رابطه بین ویژگـی‌های شخصیتی با مهارت‌های اجتماعی و پیشرفت تحصیلی دانشجویان. پژوهش های روانشناسی اجتماعی, 1396; 7(27): 79-100. مقدمه­: پژوهش حاضر به بررسی نقش واسطه­ای هوش فرهنگی در رابطه بین ویژگی­های شخصیتی با مهارت­های اجتماعی و پیشرفت تحصیلی دانشجویان دانشگاه­های شمال خوزستان پرداخته است. روش­: روش پژوهش نیز توصیفی از نوع همبستگی از طریق الگویابی معادلات ساختاری (SEM) و تحلیل مسیر بوده است. حجم نمونه مورد مطالعه در این پژوهش 375 نفر بودند که از بین جامعه دانشجویان دانشگاه­های شمال خوزستان با روش نمونه­گیری چند مرحله­ای انتخاب شدند. برای سنجش متغییرهای مورد مطالعه از پرسش­نامه­های هوش فرهنگی (انگ و همکاران، 2004)، ویژگی­های شخصیتیNEO (کاستا و مک کری، 1985) مهارت­های اجتماعی ماگر (1972) و معدل کل برای پیشرفت تحصیلی استفاده شد. تحلیل داده­ها توسط روش آماری معادلات ساختاری انجام گرفت. جهت آزمودن اثرهای مستقیم، یک الگوی پیشنهادی ارائه شد که با حذف مسیرهای غیر معنی­دار و ارائه الگوی نهایی برازش خوبی حاصل گردید. همچنین جهت آزمودن اثرهای واسطه­ای نیز روش بوت استراپ مورد استفاده قرار گرفت. یافته­ها­: یافته­ها بیانگر این بود که ویژگی­های شخصیتی برون­گرایی، گشودگی و وجدانی بودن به جز توافق پذیری از طریق هوش فرهنگی بر مهارت اجتماعی و پیشرفت تحصیلی اثر غیرمستقیم مثبت داشتند. ویژگی شخصیتی روان­رنجوری به واسطه هوش فرهنگی بر مهارت اجتماعی و پیشرفت تحصیلی اثر غیرمستقیم منفی داشت. نتیجه­گیری­: براساس یافته­های این پژوهش، ویژگی­های شخصیتی به واسطه هوش فرهنگی بر پیشرفت تحصیلی و مهارت­های اجتماعی دانشجویان، اثرگذار هستند. بنابراین پیشنهاد می­شود که نظام­های آموزشی مانند دانشگاه­ها به منظور طراحی و برنامه­ریزی­ جهت پیشرفت تحصیلی و ارتقای مهارتهای اجتماعی دانشجویان، ابعاد روانی شخصیت و هوش فرهنگی فراگیران را سنجش کنند. در این راستا برگزاری همایش­ها، سمینارها، کارگاه­ها و برنامه­هایی همچون بازدید و گردش علمی و فرهنگی، پژوهش، و مسابقات و ارائه فعالیت­های گروهی پیشنهاد می­شود. Introduction: This study aimed to examine the mediating role of cultural intelligence in the relationship between personality traits and social skills and academic achievement of students at Universities of Northern cities of Khuzestan. Method: The research methodology was descriptive and correlational through structural equation modeling (SEM) and the path analysis. Participants in the study were 375 from community of college students from the Universities of Northern cities of Khuzestan selected by multistage random sampling. Participants answered the Cultural Intelligence Questionnaire (Ang, et al., 2004), personality traits NEO (Costa and McCrae 1985) Mager social Skills (1972). For academic achievement their GPA was used. Data analysis was performed by using the statistical method of structural equations. Results: The findings showed personality traits of extraversion, openness to experience, and conscientiousness had indirect positive effect on social skills and academic achievement through cultural intelligence. Neuroticism had indirect negative effect on social skills and academic achievement. Conclusion: Therefore, educational systems such as universities should plan to promote students’ personality and cultural intelligence In order to increase their academic acheivement and social skills.. This can be done through conferences, seminars, workshops and plans such as cultural and scientific camping researche, competition and teamwork for university students. - آتش­روز، ب.، پاکدامن، ش. و عسگری، ع. (1387). ارتباط بین پنج رگه شخصیتی و پیشرفت تحصیلی. فصلنامه روان شناسان ایرانی، (16)4، 376 - 367. - تاجیک، س. (1392). رابطه سطح نیازهای دبیران با مهارت­های اجتماعی آنان. فصلنامه مطالعات رسانه­ای، (22( 8، 115-125. - جعفری، ح.، مهرداد، ح. و قدم­پور، ع. (1390). بررسی رابطه بین ویژگی­های شخصیتی و هوش فرهنگی کارکنان سازمان میراث فرهنگی، صنایع دستی و گردشگری استان لرستان. روانشناسی تربیتی ، (1) 2، 81-101. - غفاری، م. و خانی، ل. (1392). ارتباط سرمایه اجتماعی و هوش فرهنگی با عملکرد تحصیلی دانشجویان علوم پزشکی. مجله آموزش در علوم پزشکی، 13 (8)، 642-650. - کریم­نژاد، س.، آیین­پرست، ن. و علویان، ف. (1389). رابطه سبک­های شناختی و ویژگی­های شخصیتی با پیشرفت تحصیلی. فصلنامه دانشگاه علوم پزشکی استان لرستان، افلاک، (19) 6. - کشاورز، ن.، امینی، م.، مانی، آ.، نبیئی، پ.، صفاری، ز. و جعفری، م. م. (1392). بررسی رابطه هوش هیجانی و پیشرفت تحصیلی در دانشجویان پزشکی دانشگاه علوم پزشکی شیراز. مجله دانشگاهی یادگیری الکترونیکی، (3)5، 70-77. - گروسی­فرشی، ت. (1380). رویکرد نوین در ارزیابی شخصیت و کاربرد تحلیل عاملی در مطالعات شخصیت. 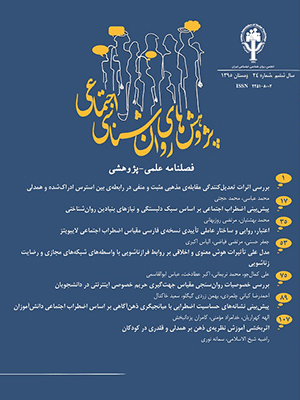 تبریز، نشر دانیال و جامعه پژوه. - لیورمور، د. (1390). رهبری با هوش فرهنگی رمز موفقیت. ترجمه سوسن علائی. دانشگاه آزاد اسلامی واحد خوراسگان اصفهان. - قدم­پور، ع.، مهرداد، ح. و جعفری، ح. (1390). بررسی رابطه بین ویژگی­های شخصیتی و هوش فرهنگی کارکنان سازمان میراث فرهنگی، صنایع دستی و گردشگری استان لرستان. فصلنامه روانشناسی تربیتی، (1) 2، 101-81. - Ang, S., Dyne, L.V. & Koh, C. (2006). personality correlates of the Four- Factor model of cultural intelligence. Group & organization management, 31 (1). 100-123 . - Ang, S. , van Dyne, L., koh, c . Ng , k . r . , templer , k . j , tay , c & chandreaschar,N.A. (2007). Cultural intelligence: Its measurment and effects on cultural Judgment and decision making , cultural adaptation , and task performance . management and organization Review , 3 (3) , 335-371. - Ang, S.&Van Dyne, L. ­(2008). Conceptualization of cultural Intelligence: Definition, distinctiveness, and nomological network. In S. Ang, & L. Van Dyne, (Eds.) Handbook on cultural intelligence: Theory, measurement and applications. Armonk, NY: M.E. Sharpe. - Akomolafe , M ., J . (2013) Personality Characteristics as Predictors of Academic Performance of Secondary School Students , Mediterranean Journal of Social Sciences , 4 (2) . 657- 664. - Allport, G . W., Ross, J. M . (1998). Personal religions orientation and prejudice. journal of personality and Social psychology, 5(4) , 432- 443. - Botha, N. (2013) The effect of identity and personality on cultural intelligence among a group of young South . Master dissertation submitted to North-West University (Potchefstroom Campus) . - Busto, v. v., prins, F. J. Elshout, J. J., & Hamaker, C. (2000). Intellectual ability, learning Style, achievement motivation and academic Success of psychology Students in higher education. personality and individual Differences, 27-1057-1068. - Brislin, R ; R. Worthely , R ., McNab, B. (2006). Cultural intelligence: understanding Behaviors that Serve People’s Goals. Group and organization. Management. 31(1) . 40- 55. - Cianci, C and carter, C (2013) Cultural intelligence elements in hsistem Learning Communities. - Brislin, R., Worthely , R ., Mcnab, B . (2006). Cultural intelligence: understanding Behaviors that Serve People’s Goals. Group and organization. Management. 31(1) , 40- 55. - Chen , G. , Gully , S.M ., Whiteman , J. A ., & kilcullen , R. N . (2001). Examination of relationship among trait-like individual difference state – like individual difference , and learning performance. Journal of Applied psychology , 85 (6) ,835-47 . - Crowne, K . A . (2008)what leads to Cultural intelligence. Business Horizons. 51, 391-399. - Duff, A., Boyle, E., Dunleavy, K., Ferguson, J. (2004) The relationship between personality, approach to learning and academic performance. Personality and individual Differences , 36- 1907- 1920. - Farsides, T., & Wood Fileld, R. (2003). Individual differences and undergraduate academic Success: The roes of personality, intelligence, and application. Personality and Individual Differences, 34 , 1225- 1243 . - Hakimi , S., Hejazi , E , Lavasan , M ., G . (2011) The Relationships Between Personality Traits and Students’ Academic Achievement . International Conference on Education and Educational Psychology (ICEEPSY 2011). - Lounsbury, J. W., Saudargas, R. A., Gibson, L. W., & Leong, F, T. (2005). An investigation of broad and narrow personality traits in relation to general and domain- Specific life Satisfaction of College Student. Research in Higher Education, 46, 707- 729. - Jensen , M . (2015) Personality Traits, Learning and Academic Achievements , Journal of Education and Learning , 4(4 ) . 91-108 . - Komarraju, M., Karau, S, J., Schmeck, R , R (2013). Role of the big five personality traits in predicting College Student’s academic motivation and achievement. Learning and individual Differences . 19 (1) , 47 - 52. - Murphy, L., Solauye, A. (2013). Evaluating the Impact of Two Globalization Projects on College Student’s Cutual Competence and Cultual intelligence (CQ). The Journal of Effective Teaching. 13 ( 1) . 5-18. - Mansuri, L (2014) Cultural intelligence: A Pathway Building Peace. GJRA- GLOBAL journal For research analysis, 3 (5 ), 2277- 8760. - Peterson B (2004). Cultural intelligence: A Guide to working with people From other Cultures. varmouth: M.E. intercultural press. - Paunonen, S.V., Ashton, M , C. (2001). Big Fire predictors of academic achievement. Journal OF Research in personality, 35, 78- 90. - Petrovic, D . (2011) How do teachers perceive their Cultural intelligence? Department of psychology, Faculty of philosophy, university of Belgrade. Social and Behavioral Sciences, 11, 276- 280. - Premuzic, T. Furnham, A. (2003). personality. predicts academic performance: Evidence From two longitudinal university Samples. Journal of Research in personality, 34, 319- 338. - Rimfeld, K., Kovas, Y., Dale, P. S., & Plomin, R. (2016). True grit and genetics: Predicting academic achievement from personality. Journal of Personality and Social Psychology, 111(5), 780-789 . - Shu , F ., Macbee , S , T ., Ayman, R. (2017 ) The HEXACO personality traits, cultural intelligence, and international student adjustment . Personality and individual differences , 106 , 21- 25 . - Tan, J ., S . (2004) . Issues & observations : Cultural intelligence and the Global Economy , Leadership in Action , 24 ( 5 ) ,2-24 .